A well-to-do Israeli family gets a knock on their door. Their son serving in the Israeli army has died. This begins act one of one of the year's most intriguing movies. The family's grief and reaction brought me back to personal loss in my own life, when small things can set off anger and confusion. The scene changes to the assignment of the young soldier. He's stuck on a border crossing between Israel and Palestine, where an occasional camel wanders by and revelers & partygoers show credentials. The final act wraps the story in ways the viewer never expects. 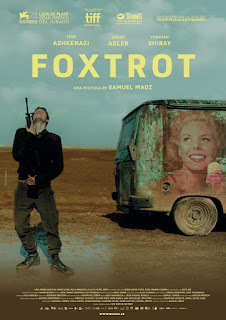 "Foxtrot" keeps your attention, tells a gripping story, and goes beyond one family's grief. "Foxtrot," 3½ stars, rated "R." Does it deliver what it promises? Intriguing and surprising story. Is it entertaining? Keeps your attention. Is it worth the price of admission? One of the year's best.